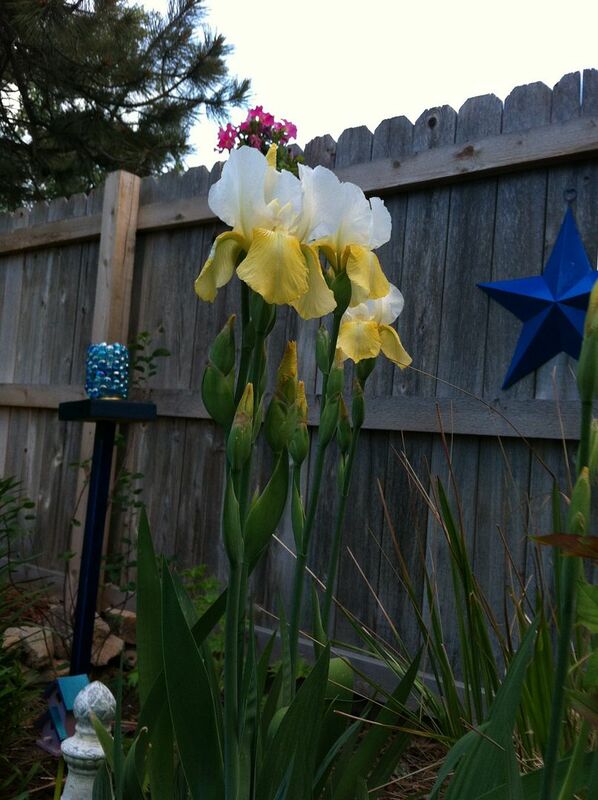 ic Kathe With an E: My Irises Are Blooming! A few years ago, we had a neighbor that was considered a Master Gardener. His front garden was a delight to see each day as the flowers he lovingly cared for bloomed. Alas, due to some personal issues, he had to move away. But, before he left, he allowed me to adopt some of his flowers. I chose some irises to dig up and replant in my back perennial garden. and the third year they run. 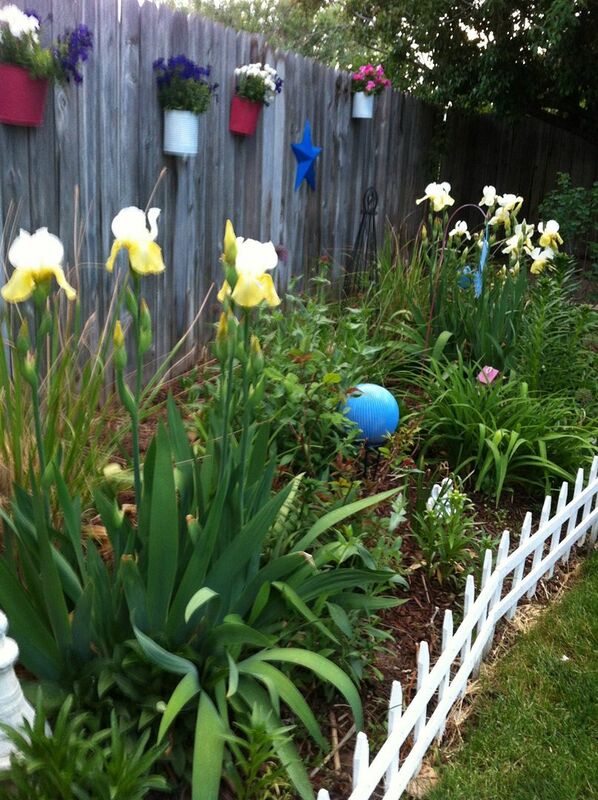 because of our cool wet Spring, the irises are definitely running this year! and these are so tall I barely have to bend to get a good look at them. I love the white and yellow combination. chocolate brown irises too but, now I am glad I stuck with just the white. I just love how tall and straight they stand in the garden. They bloomed just after my alliums were done for the Spring. for even, fingers crossed, more blooms next year. Don't forget to come by on Tuesday's for the link party. I love adopting neighbors perennials. That's where I got my globe thistle. Pretty irises. Your irises are beautiful! Flowers make me so happy, thank you for sharing! I'm visiting from Frugal Crafty Home Blog. I hope you have a terrific week! Wow, I have purple Irises...and now I am thinking some yellow ones would really pop too. Yours are gorgeous! Don't ya just love them....they are no fuss flowers. Wow, I never saw this combination before. They are beautiful, Kathe. 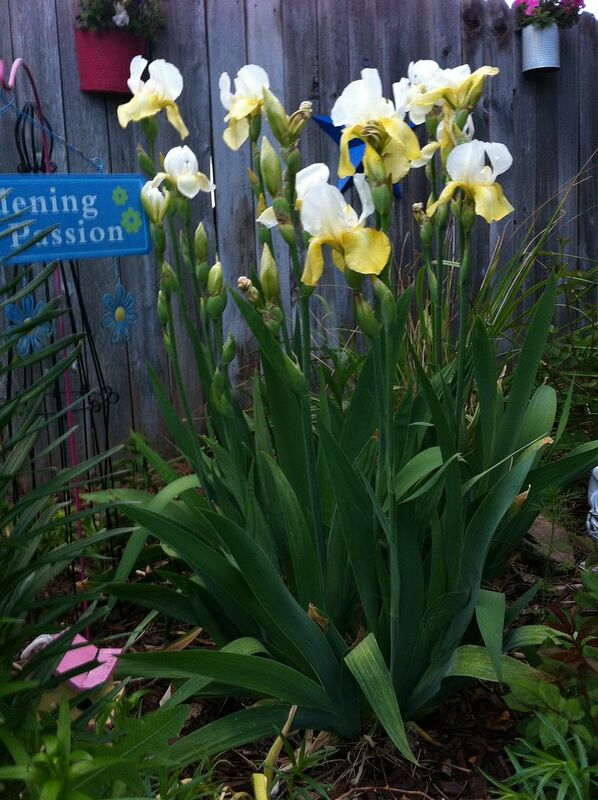 I love irises because they are so easy to grow! Love the color! Near to our studio, there was a business that planted masses of flowers for the enjoyment of the city. The business moved to one of the suburbs, but left behind the plants! I have been thinking of digging up some of their irises, and I really should try to do so, because these plants were "abandoned". The city is going to re-route a major freeway right through the place where this garden was located. I was just reminded of this while seeing your beautiful irises! Thanks for sharing. Beautiful. I love that color combination. That was so cool he let you have those. He knew you would love them like he did. I love your fence and pretty buckets. Great garden! Good Evening Kathe, What a joy these Irises are, the colour is so beautiful. I love plant sharing because as the flowers grow, you remember the person who gave you the gift. My daughters know I much prefer plants to cut flowers, because I enjoy seeing them year after year. I love Iris's! Your yellows are gorgeous. We have a beautiful purple in our yard! They make me happy when they bloom! Ooh those are so pretty! I don't have any that get quite that tall! Mine are close to bloooming but not quite there yet. That is so nice that you have those to remember your neighbor by. I carried a plant with me for years and years from a neighbor's home from house to house to house! I like your planters on the fence wall- I never thought of doing that! Beautiful irises! I can't wait until mine are up. We're so late this year!! Stunning! I love the colors too! Mine are blooming right now, too! So so pretty! 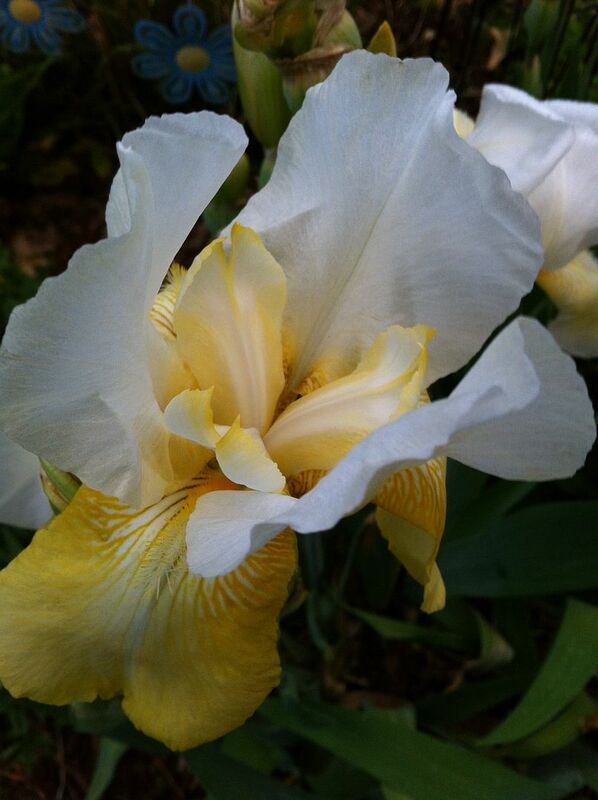 I love irises! your irises are amazing!Thanks becouse made colored my day! 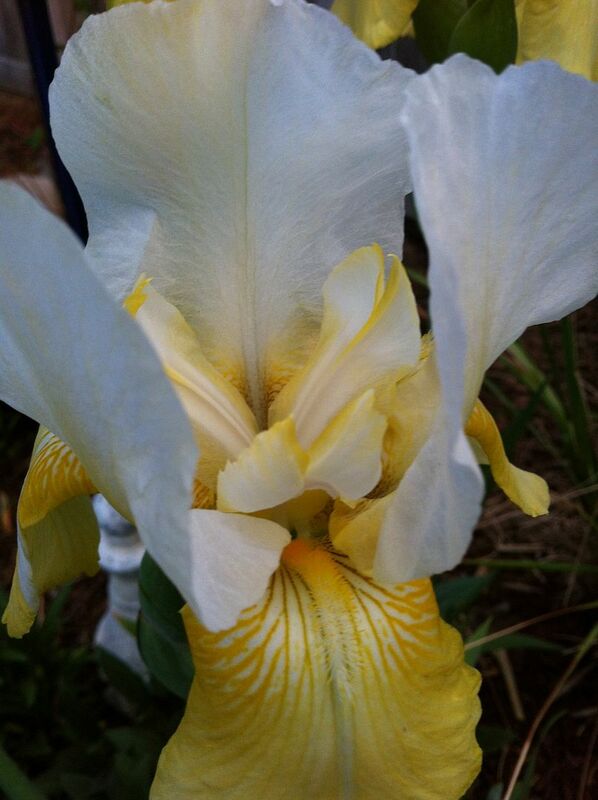 Your yellow and white iris are stunning! Love your stars and planters on your fence, too. Great garden art, great garden! Iris are one of my favorite flowers. For some funny reason, I don't have any in my garden. Yours are just stunning! Thank you for linking this to the In and Out of the Kitchen party! I am so happy your brought these flowers for everyone to see! Your flowers are beautiful, but whenever I see a picture of your garden that blue star on the fence always catches my eye. Thanks for sharing at Fluster's Creative Muster Party. They are beautiful. I love any flowers. 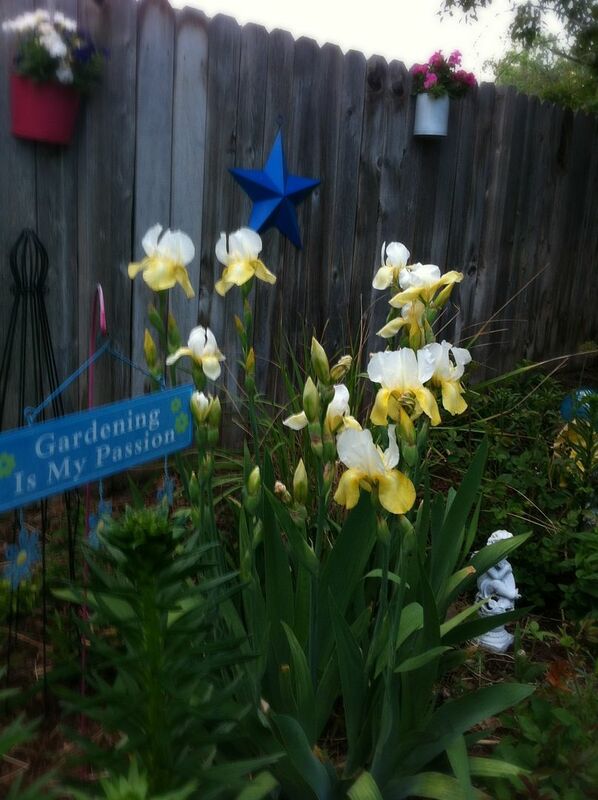 I popped over from Bloomin' Tuesday and love your yellow and white irises! Just beautiful! I'm planning on having some Iris at my new place. Love these gorgeous yellow one's! Thanks for linking at TTF this week. iries, I was visiting my daughter this wk. The neighbor had chocolate brown iries . they keep their gate locked and one night they had the gate open. My husband knocked on the door and the son and father came out to the garden where I was standing. I asked if I could buy some iries plants, the son spoke to his father and he said yes, just take what you want. They gave me the plants !They were such nice people ( romanian) So the next day I was able to get one small chunk and one large chunk and you could not tell the iris bed was disturbed. I am going to plant them in the flower bed behind my pond. I have pure white, purple and white, pale lavender, lavender with pale brown. The only yellow I have are the cyprus iris. Great Garden Kathe. Thanks so much for sharing with Adorned From Above's Blog Hop. We always love seeing everyone's posts. Have a great week and here is this weeks party has started. Here is the link. Beautiful. Thank you for joining Home Sweet Home. Just beautiful! I popped over from Bloomin' Tuesday.